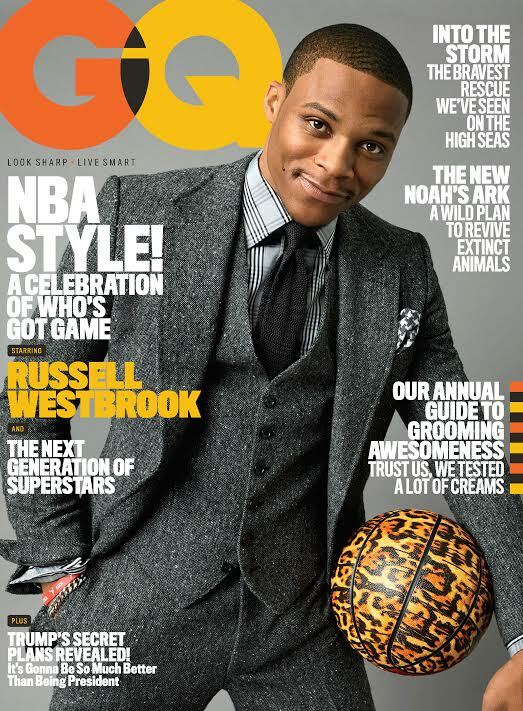 Oklahoma City Thunder superstar Russell Westbrook is gracing the cover of GQ this month, and while he posed in sharp-looking suits, he also opened up on Kevin Durant's departure, the upcoming basketball season and more. "The thing about me you have to know is, I don't care what other people are doing. I. Don't. Care," Russell Westbrook told GQ's Daniel Riley of being pitted against Steph Curry and LeBron James for last year's league MVP. "I'm so busy worried about how I can improve, I just don't have time to worry about what any other person is doing." Despite Durant's exodus from Oklahoma City last spring, Westbrook doesn't seem to have any hard feelings. "The whole thing in the NBA is that people sometimes have an opportunity to go where they want," he says. "And Kevin chose a place where he wanted to go." Despite his seeming indifference to Durant's leave, Westbrook says that they haven't talked much since. But did Westbrook ever considering leaving the Thunder, himself? "It was very simple," he says. "I wasn't trying to figure out if I was leaving or not. I was happy where–––I am happy where––I'm at." Explaining his aggressive, yet effective, playing style––his need to drive into traffic on every play––Westbrook is refreshingly humble: "I don't know how to be cool. You know what I mean? That's not in my nature. I only know how to play one way. I can't, like, decide to turn the switch on and off. I'm not good enough to do that." Reflecting on the beginning of his basketball career, Westbrook admits: "I was never the best player. Not ever in my life. Though even when I was younger, I felt that on any given day I could be. And that mentality's what's helped me get over the hump each and every day to where I was meant to go." The November issue of GQ will be available on newsstands in New York and L.A. on Tuesday October 18, and will be available nationally October 25.